Damaris Lewis has become a familiar face around the NBA. The model from Coney Island spoke to the Crossover about returning as the official trophy model for the 2nd annual NBA Awards, her upcoming movie with Spike Lee and more. Damaris Lewis should be a familiar face to NBA fans by now. Lewis, who previously co-hosted NBA Style with Lance Fresh, will be presenting trophies at the NBA Awards for the second straight year on Monday night. Lewis also used to run her own hoops blog, and she starred in the lead-in video for the 2013 NBA All-Star Game, in case you’re wondering why her mug keeps popping up next to the league’s biggest stars. If it’s not the basketball that rings a bell, then it could be Lewis’s other line of work. The MUSE model has also graced the pages of SI’s Swimsuit Issue. 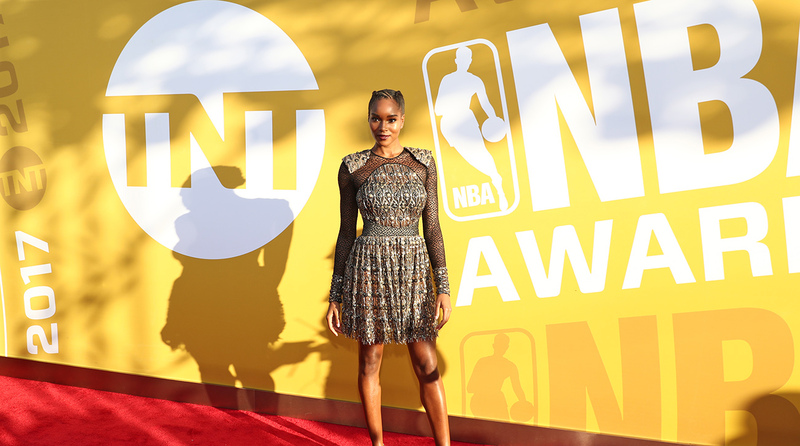 The Crossover recently caught up with the dual-threat Lewis to discuss the NBA awards, her role in the new Spike Lee movie, modeling memories and more. Rohan Nadkarni: What did it mean to you to basically be the only woman on stage at the awards last year? Damaris Lewis: There’s this conception that if a female likes sports it’s like a “big thing.” Like, oh she’s so cool she likes basketball. Uh, no. Most of us just pick a sport. I think about how when we’re all little kids if a girl picks blue she’s automatically labeled a tomboy instead of a girl who likes blue. Instead of being a girl who oddly likes basketball, I’m just a girl who likes sports. When people watch it and they do see me, who is not very conventional as a trophy model—last year I wore 30 pounds of armor from Sophie Theallet and braids in my hair—and I did that on purpose, so that you can see it doesn’t matter who you are, you can be on a stage. RN: What was your favorite moment from last year’s show? DL: My favorite moment from last year’s show was being backstage watching Drake work. A lot of us either know him from Degrassi or know him as a rapper. He was an amazing host, he’s an amazing actor. Watching him work, watching him be so focused the entire time. He never missed a beat. That was really fun. RN: Is it still exciting for you to be around NBA players? Or are you used to it by now? DL: Oh my gosh, so I grew up in the projects where they shot He Got Game. I’m from Coney Island, the exact projects you see in the movie and the blue basketball court. I have loved basketball since I grew up. I grew up playing it at the Boys & Girls Club. When I see Grant Hill come backstage, or when Russell Westbrook comes up on stage because I’m handing him MVP, or I’m standing next to Adam Silver, it really, honestly, I’m screaming on the inside. It’s a very cool experience for the girl from Coney Island. It’s also very humanizing. You realize these people are athletes but we’re also the same. We’re here to do our job. It’s really nice to see those people in that realm. RN: As a fan, what are you most looking forward to this offseason? DL: Obviously, LeBron, following the saga of LeBron and what happens there. When any major player moves, every single person who is in love with the NBA has their idea of where they should go. Whatever he does, half the people are going to love it and half the people are going to hate it. So for me, it’s definitely what happens next with the LeBron saga. RN: What are you most excited about for this year’s show? DL: Anthony Anderson! Our host this year is Anthony Anderson and I have honestly never left that man’s side without my gut hurting from laughing. He’s one of the funniest people I’ve ever met in my life. He’s going to be doing a collaboration with the TNT guys. RN: Anthony Anderson is hilarious but he played a bad guy in The Shield and he was terrifying. DL: That’s funny, I always remember him from Transformers. That’s one of my favorite movies and my boyfriend gets on me for that all the time but I don’t care. And I also watch Blackish now. To see the rise of Anthony Anderson. I actually played in a celebrity basketball tournament with him in Arizona. RN: Really? Can he play? DL: He’s good! It was me, him, Terrell Owens, Bubba Watson—whose game is ridiculous. But Anthony had us in knots the entire game. The squad was real. And our ref was Evander Holyfield. RN: What’s your favorite memory from an SI Swim shoot? DL: Hot air balloon in Cappadocia, Turkey. That was, yeah, we all woke up at 5:30 in the morning. Randall Grant, he used to do behind-the-scenes photography. We got up in that hot air balloon and Randall was taking pictures of me, and everybody was in the balloon. And coming from Coney Island, you don’t really see aerial views that spectacular, and architecture like that I had never seen before. That was a defining moment when I knew travel needed to be a part of my life. But also, there’s no steering wheel in a hot air balloon. It’s the utmost trust you can have in the elements or the wind. Turkey was the trip for me that really opened my eyes and changed the game for me. RN: What’s the strangest thing you’ve been asked to do on a photoshoot? DL: Oh, that’s a hilarious. I had to straddle a plane. I literally had to straddle a fighter jet at the palm springs air museum. Normally you get to hair and makeup and it’s like, “Today you’re going to be shooting at the beach!” No, that day it was like, “You’re shooting on a fighter jet. You’re going to be in a bikini, and it’s 30 degrees outside.” And they didn’t just want me to sit on it, they wanted me to straddle it.